Stowford Paper Mill contributed greatly to the industrial heritage of Ivybridge with a history spanning over two centuries. Over the years the mill commissioned several special watermarks to commemorate memorable events and below some of these are reviewed in more detail. 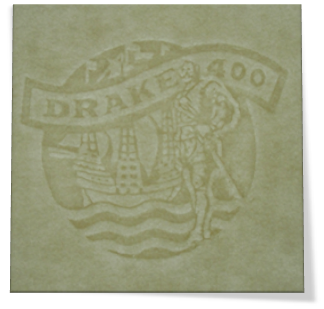 In September 1980, Stowford Paper Mill at Ivybridge produced a ‘Drake 400’ watermark, commemorating the 400th anniversary of Sir Francis Drake’s circumnavigation of the world. Drake was of course born relatively locally to the mill and is most famous for playing a game of bowls on Plymouth Hoe, while waiting for the tide to change, before sailing out with the English fleet to engage with the Spanish Armada in 1588. 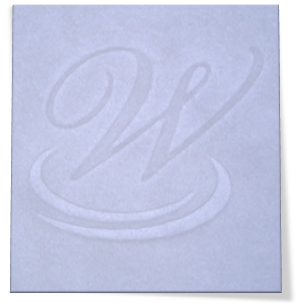 The City of Plymouth celebrated the voyage with a 142-day Drake 400 festival, so it was only fitting that the mill produced this special watermark in cream wove A4 paper. A magnificent stained glass window depicting Queen Elizabeth I with Drake aboard his ship, the Golden Hinde, exists at Stowford Lodge, the former Mill Manager’s residence at Ivybridge. A statue of Francis Drake by Joseph Boehm was unveiled on Plymouth Hoe on 14th February 1884. The day was observed as a general holiday and an estimated crowd of 20,000 (including 3,000 schoolchildren) flocked to the Hoe. It is a replica of the celebrated Boehm statue in Tavistock which stands closer to Drake’s birthplace, but it is not thought to be a good likeness of the great seafarer. The Queen visited Plymouth in 1988 to help mark the 400th anniversary of the defeat of the Spanish Armada. The city staged a month-long celebration of Drake during July, culminating in a massive firework display which attracted thousands of people to the Hoe. The Armada sundial was commissioned for the occasion of the 400th anniversary and was one of the first major works by architect Carole Vincent. The structure stands 27 feet high which made it one of the biggest horizontal sundials in the UK at the time and is now a popular meeting spot in the city centre. On 9th September 1987, Stowford Mill celebrated 200 years of paper making on the same site, next to the River Erme. The mill’s Bicentenary was celebrated by a number of events which included tours of the mill for local employees’ families, and visits by local dignitaries, mill customers and local business executives. The bicentenary was further marked by a special making of prestige paper, marked with the mill’s 200th anniversary logo and made into writing sets as gifts for visitors to the events. The paper was typical of the mill’s output of the time and matched paper from Wiggins Teape’s Conqueror range, a leading brand of high quality business stationery. The paper was a cream wove 100gsm quality. The original pencil sketches of the paper mill with the Ivy Bridge in the foreground were drawn by a keen illustrator and employee of Wiggins Teape, the late Mr Courtney Pippin. Courtney had worked at the mill from the late 1950s before retiring in 1981. The first sketches of the paper mill, dating back to the 1970s, were borne out of Courtney’s passion of drawing. So striking were his sketches, they soon featured as part of the paper mill’s unique identity. Adapted versions of the original sketches appeared on mill brochures in both printed and embossed forms, as well as paper sample folders and internal newsletters. It was also used on Stowford Mill mugs, which served as gifts to employees, clients and visitors alike. However, its true destiny was realised when it was adapted for a watermark and used to create high quality writing paper. 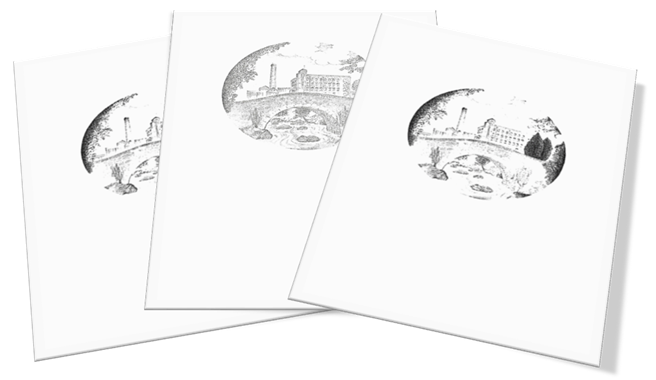 Special stationery packs with matching envelopes served as lasting mementos for customers and visitors to the mill. For the Bicentenary celebrations of the paper mill in 1987, a special edition of the logo and watermark was commissioned with the dates 1787 – 1987 appearing underneath. A special run of prestige paper, marked with this 200th anniversary logo, created special stationery for the employee and local media events and made into writing sets to serve as gifts for visitors to the events. The design was also used to produce etched glasses given to every employee working at the mill and even featured on the new glass entrance doors to the mill’s reception. 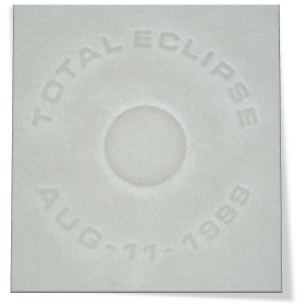 On 11th August 1999, up to 350 million people in Europe and Asia witnessed the last total solar eclipse of the 20th century. 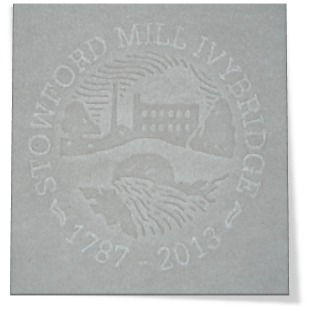 To commemorate this ’once in a lifetime’ event, Ivybridge Paper Mill commissioned a special watermark, centred in an A4 size sheet. Ivybridge fell in the band of totality of the eclipse of the sun on 11th August 1999. Shortly after 11 am, darkness fell for a brief 1 minute 41 seconds. Although the sun was obscured by several layers of cloud, the sudden fall of darkness, shortly followed by the dawn, will be remembered by everyone who was fortunate enough to have experienced the event. The phenomenon began over the Atlantic, a few hundred miles east of Boston, North America. Devon and Cornwall were the only UK locations to fall in the “zone of totality” where all direct sunlight was blocked, meaning that thousands flocked to the region to witness the first total eclipse visible in the country since 1927. Cloudy skies meant spectators there were unable to see the full effect, but the spectacle was still dramatic. The 1999 total eclipse was the first over mainland Britain since 1927 – the next will not be until 2090. 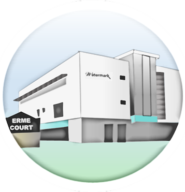 The paper mill responded by saying “We were honoured to hear that The Watermark had been chosen as the name of Ivybridge’s new centre, in recognition of the significance of the paper mill in the history of the town. We immediately decided that the most appropriate way to demonstrate our appreciation was to produce a special paper incorporating The Watermark logo. A presentation board of how this watermark was created, along with two examples of dandy rolls, can be viewed upstairs at The Watermark. 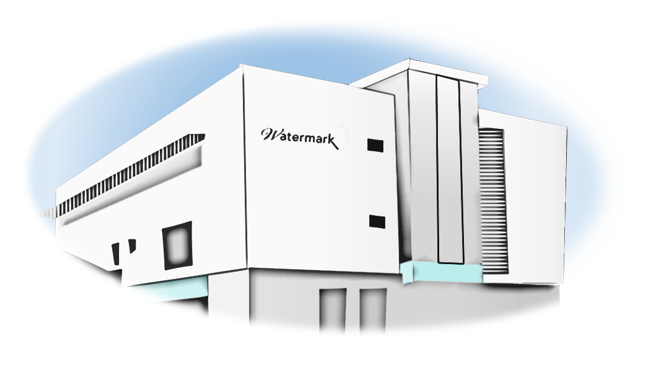 The Watermark was officially opened on Thursday 2nd October 2008 by the Princess Royal. Dandy Rolls - what are they? The original dandy rolls consisted of a framework of lengthwise wooden ribs onto which round metal discs were attached in order to loosely support a woven wire fabric cover. Later dandy rolls consisted entirely of metal. The watermark designs were originally tied on to the cover with fine wire. The invention of the so-called ‘dandy roll’ is attributed to John Marshall of the firm T.J. Marshall of London, established in 1792. Simple ‘plain’ wove dandy rolls are used purely to consolidate the forming sheet of paper whereas wove dandy rolls bearing a design, as well as laid dandy rolls serve both to consolidate and create the watermark image within the paper. Dandy rolls need to be light for ease of transportation yet rigid in construction to withstand the production processes. The internal cylindrical body of the roll is constructed of stainless steel and comprises of a series of rings forming a skeleton framework to support the mesh cover. The relatively fine woven mesh cloth incorporates a soldered seam to join the two edges together in order to form the cylinder. This seam can be with straight or spiral in design depending on the needs of the cover. 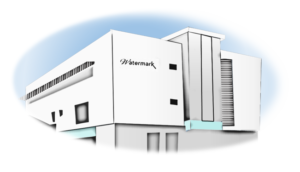 If a watermark is required, then the design is either soldered on to the wire cloth or embossed into the wire cloth, by the use of heavy duty embossing plates. Once employed on the paper machine, the design will either create thinner areas within the forming sheet of paper, providing a light image, or create denser areas providing darker tones. The iconic image of the paper mill was adapted a final time in 2013, to produce one of the last production runs of watermarked writing paper, commemorating the 226 years of rich paper making history of the small specialist paper mill located in South Devon. 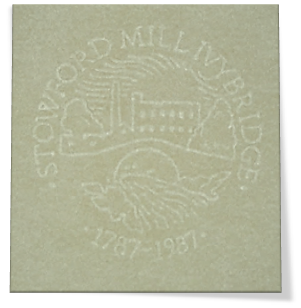 Although similar to the watermark designed in 1987 to commemorate the Bicentenary of the paper mill, this new watermark image incorporated a tonal representation of the mill and ivy bridge, together with the dates 1787 – 2013. Each employee was presented with a special gift box of A5 stationery and matching envelopes as a lasting memento of their services to the mill. The dandy roll bearing this historic watermark embossing was kindly donated to the Ivybridge Heritage & Archives Group and now resides upstairs at The Watermark.